MPs should be given a dress code - to stop standards slipping in the Commons chamber, says a Labour MP. Thomas Docherty, new MP for Dunfermline and West Fife, raised a point of order suggesting several MPs had been spotted wearing denim in the House. Later he told the BBC the point had been "semi-serious" but some women MPs had been "rocking up in a mixture of denim and knee length boots". Deputy Speaker Dawn Primarolo said all MPs knew they should dress smartly. MPs laughed as she suggested Mr Docherty speak to those concerned directly, adding "I'm sure they would welcome it". Mr Docherty had raised the point that some MPs were wearing "such items as denim in the House of Commons and catching the Speaker's Eye" and, as a new MP, asked for guidance "as to what is an appropriate dress code for the mother of Parliaments?" Ms Primarolo said it wasn't for the deputy Speaker to comment on MPs' "sartorial elegance" - but all MPs knew they should dress smartly. Mr Docherty suggested the dress code be circulated "so all members on both sides of the House so that we don't have dress down Thursday in future". Later he said he had noticed a "handful" of female MPs on the Tory and Lib Dem benches - who sit opposite Labour MPs - wearing black denim, knee length boots and leather jackets. He said MPs taking part in debates should dress in "what most people would regard as business attire" - although he added that those in the division lobbies sometimes turned up in gym kits, due to the short notice given for votes. He said he was not looking for a "return to coat and tails" but had raised it as a "semi serious point about dress codes" as he had noticed more MPs were going "smart casual". "If the Speaker allowed, for argument's sake, women to wear dark denims and then gentlemen rocked up in, as the Americans now often do, chinos and a sports jacket - would the Speaker pull them up?," he said. "If we don't have a standard it will continue to gently drift," he said. 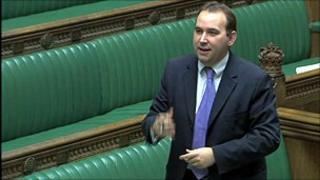 In 2002 Labour MP Kevin Brennan officially called for "dress down" Thursdays and took off his tie in the Commons chamber - only to be ticked off by then Speaker Michael Martin after Tory MP Michael Fabricant raised it in a own point of order. A House of Commons spokesman said the dress rules for the Commons were actually quite vague. The 2004 edition of Erskine May, the official parliamentary rule book, states: "Members are not permitted to wear decorations in the House. The wearing of military insignia or uniforms inside the chamber is not in accordance with the long-established custom of the House. "The Speaker has also stated that it is the custom for gentlemen members to wear jackets and ties." Parliament's own guidelines point out that the Speaker has "on a number of occasions, taken exception to informal clothing, including the non-wearing of jackets and ties by men". Men are also not allowed to speak in the chamber while wearing a hat however, until 1998, MPs wishing to raise a point of order during a vote had to wear a hat - a collapsible top hat was kept in the chamber in case it was needed.